Actually, it was for 15 seconds, and it was on a digital sign. But it was a 45-foot tall sign at Times Square, New York. And it made me feel like a big shot! I really do applaud TIME for making people feel special by running this promotion. Here’s the low-down: TIME invited 50,000 people to submit their snaps online, to promote Person of the Year. I gave it try, and let’s face it, I was only one of the thousands of faces flashed on the sign. But the feeling is exhilarating, the thought that I was there, miles away from where I sat. I hope to visit New York some day, but at least I have already been there, in a way. 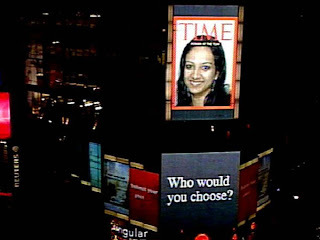 Tarana, I feel so happy to read that you were on the cover of Time. Great to hear. I have been reading your other write-ups as well. You share good thoughts. Wonderful.